Test flask-shaped, smooth, consisting of a cephalis and incomplete thorax. Cephalis smooth, with a few small circular pores, subhemispherical to subglobular, separated from thorax by a slight constriction. Thorax narrow and conical in its proximal one-fourth to one-third and abruptly changes contour but smoothly to a widely inflated subcylindrica1 or nearly truncate-conical portion which comprises its distal two-thirds to three-fourths. Thorax incomplete distally with no definite termination at mouth; mouth not constricted; no evidence for an abdomen or abdominal rim. Thoracic pores arranged hexagonally in transverse rows; in the proximal portion pores subcircular to circular, separated by heavy intervening bars, arranged in 4-6 transverse rows; in distal portion pores hexagonal to subcircular, larger, separated by thinner intervening bars beginning at the level of the contour change, arranged in 6-12 transverse rows, pores of each row approximately equal; pores increase slightly in size around contour change but become slightly smaller and remain approximately the same size in distal one-third of thorax. Four collar pores present; pores corresponding to jugular pores present in proximal dorsal part of thorax; the secondary lateral spines are represented by ribs occupying the dorsal part of the collar stricture, and in a few tests they extend laterally as short, thin, conical spines; vertical bar thin, extends as a short, thin, conical vertical spine; apical bar a dorsal rib in cephalic wall, extends as and is collinear with a short, thin, conical apical spine; dorsal and primary lateral bars extend from the collar ring as relatively thin, conical spines of variable length and do not extend as thoracic ribs. Measurements; based on 20 specimens from stations 133, 136, 184, and 191: length of test 84-129 µm, of cephalis 15-18 µm; breadth of cephalis 16-23 µm, of thorax 75-123 µm; length of apical spine 2-16 µm, of vertical spine 4-7 µm, of dorsal and primary lateral spines 6-22 µm. Remarks. 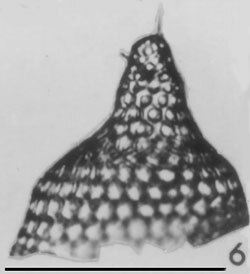 This species differs from Theopilium tricostatum and Coracalyptra cervus in its nearly cylindrical flask shape and the absence of an abdomen or abdominal brim. No species illustrated in the literature could be identified with this species; therefore, it may be a new species, but examination of more specimens is needed to define its complete range of variation before a new name is proposed. This species is assigned to Eucecryphalus Haeckel because the primary lateral and dorsal spines arise from the collar ring, do not extend as ribs in the thoracic wall, and the test consists of only two joints. Distribution. This species is rare in the Gulf but occurs as far north as stations 191 and 192, being nearly common at the former. It is present at only five stations in the southern Gulf, namely 34, 60, 91, 92, and 93. It does not respond to upwelling in the southern Gulf. In the northern half of the Gulf it has a more general distribution at stations located within the diatomite facies; it is absent at stations 130, 194, and all those to the north. This fact plus its increased frequency at stations 191 and 192 indicate the its response to upwelling only in the northern Gulf. Its absence at marginal stations indicates its preference for more nearly oceanic, offshore Gulf waters. DESCRIPTION: Cephalis hemispherical with small pores and spines. The thorax smooth and characteristically beret-shaped with regular hexagonal meshwork whose pores are 2-5 times as wide as interporous bars. There are 11-14 rows of pores in thorax in the longest meridian. DIMENSIONS: (11 specimens) Minimum diameter: 120-145 µm; maximum diameter: 150-175 µm.